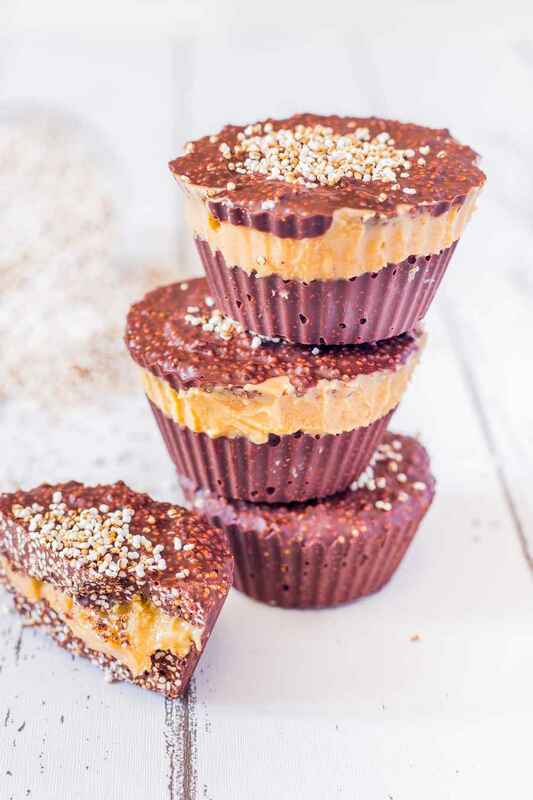 Amaranth Crunch Cups with Peanut Butter (V, GF): a 3-ingredient recipe for no-bake crunchy, delicious and chocolatey cups that will make you come back for more! 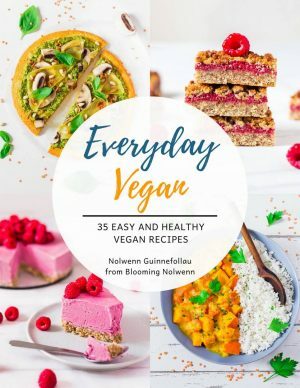 Vegan, No-Bake, Gluten-Free, Oil-Free, Refined Sugar-Free. Have you ever heard of amaranth? It is a plant native to Mexico that the Aztecs cherished for its incredible nutritional value. The amaranth seeds are even tinier than quinoa. You can boil them, eat its sprouts or pop them like popcorn. How cool is that? I personally don’t like the sticky texture of boiled amaranth that much so when I heard that you can pop them, I rushed into the kitchen to try it! Popped amaranth tastes very good and has a nutty flavor. 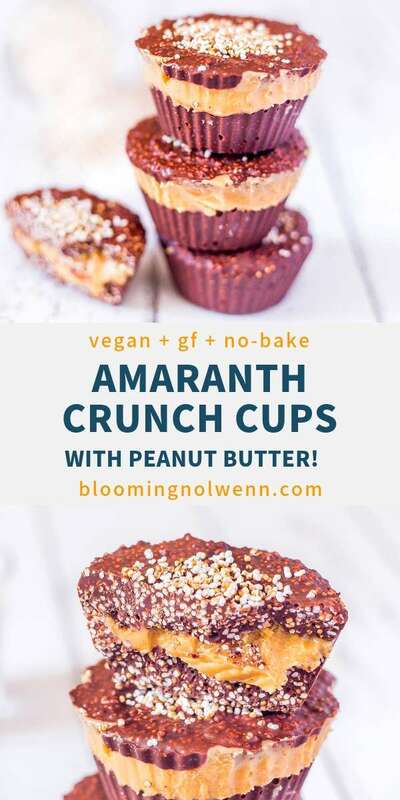 I highly recommend that you make a big batch of it because it is so good that we almost ate it all before I could make the Amaranth Crunch Cups. You can enjoy it with plant-based milk for breakfast or in granola for example. 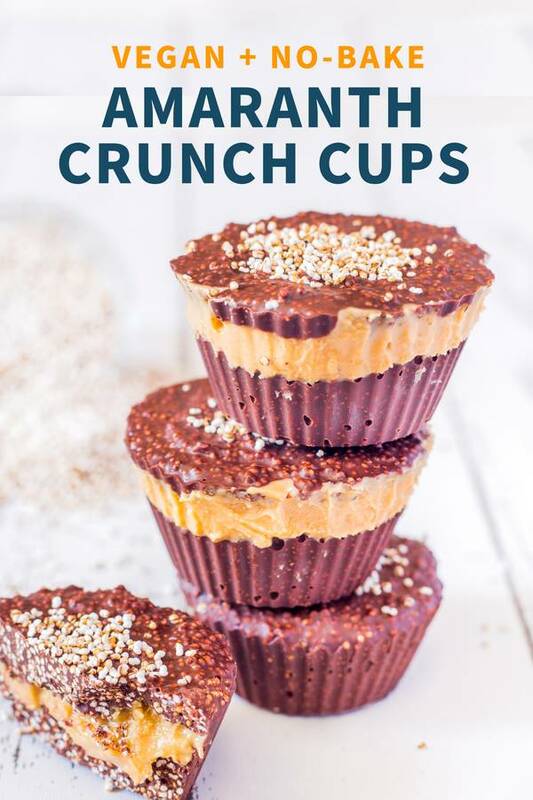 You will only need 3 ingredients to make these cups – popped amaranth, dark chocolate and peanut butter. To pop amaranth, simply place the seeds in a hot non-stick pan. I suggest that you work with one teaspoon at a time to avoid burning the seeds. It may take a bit more time but it’s worth it. Now let me warn you – the seeds will pop as soon as you place them in the pan, so you should put the lid on right away if you don’t want to have tiny little amaranth seeds all over your kitchen. Trust me, this is what happened to me! 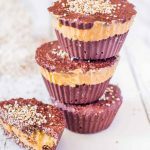 Amaranth Crunch Cups made in no time and with only a few ingredients! Vegan, gluten-free, oil-free and refined sugar-free. Carefully melt the chocolate using the double boiler method. Be careful not to burn it. Once the chocolate is melted, stir in the popped amaranth. 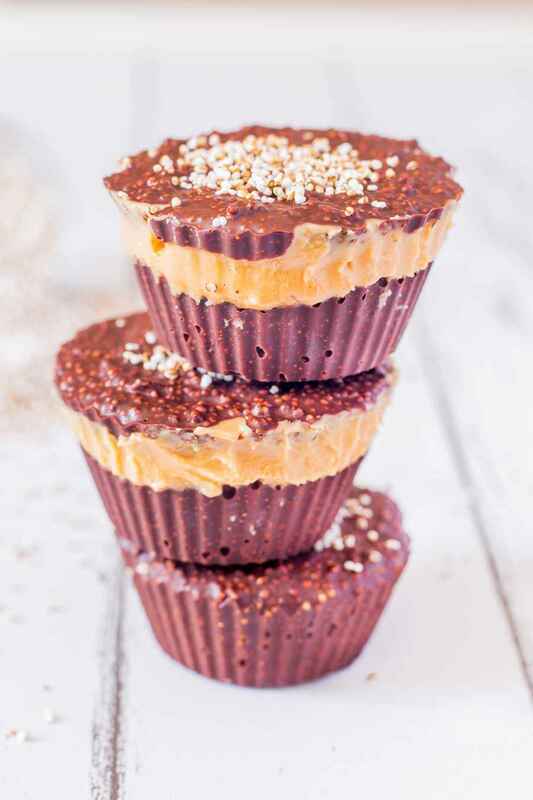 Fill each silicone cupcake cups halfway with the chocolate mixture. 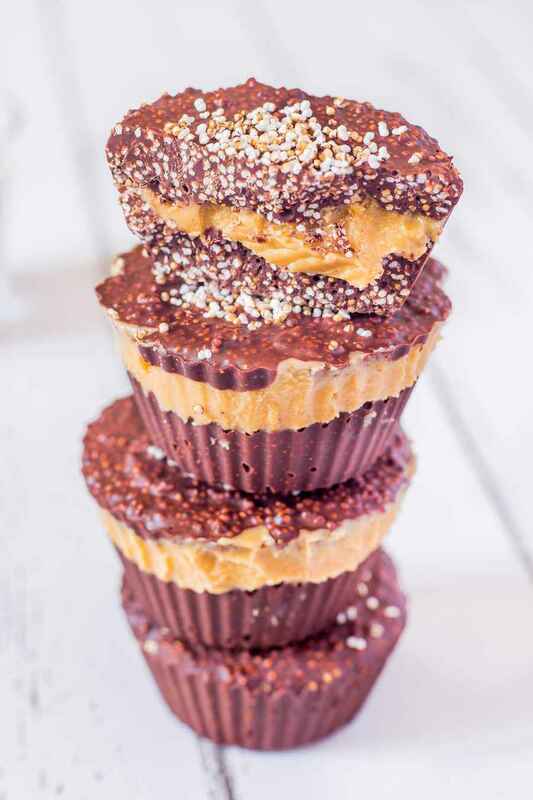 Add one teaspoon of peanut butter in the centre of each cupcake cup and fill with more chocolate mixture. Top with more popped amaranth. Freeze for 1 hour. Take out of the freezer 5 minutes before eating. Enjoy! Oh man, this looks good! 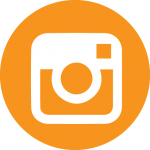 I have recently jumped into being vegetarian but really want to limit dairy. 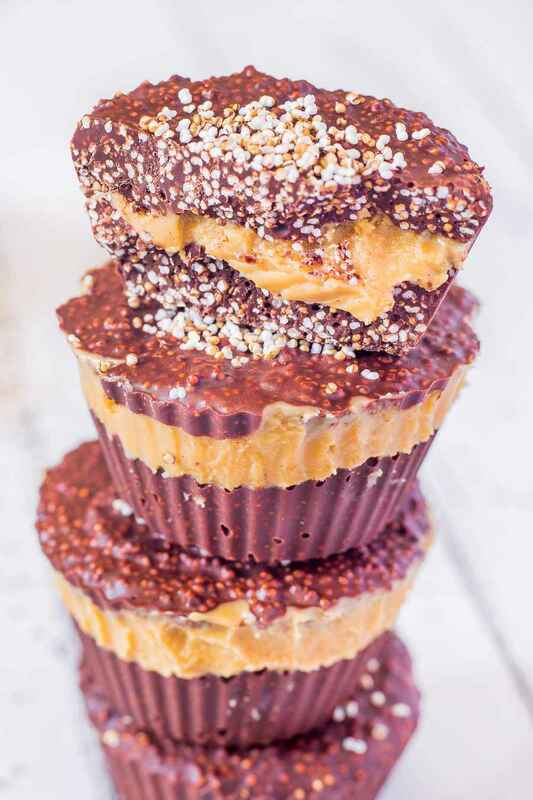 This is a sweet treat that is right up my alley. Your pictures are absolutely beautiful. 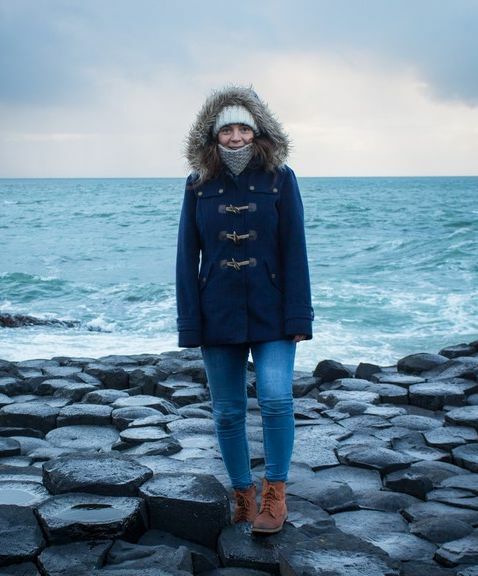 I need some tips for my travel blog. I wish you the best for your vegetarian journey!